Black Swedish Ivy is very hardy and easy to maintain. With beautiful, cascading vines and scalloped shaped, dark green leaves, it adds color and interest to the home, office or classroom. This species of ivy grows quickly and is the perfect choice to teach children to care for plants. The responsibility of caring for houseplants is an appropriate precursor to teaching children to care for pets, and a wonderful way to connect them to nature indoors. In addition to being easy to grow, Black Swedish Ivy can improve the air quality of the space, adding to its appeal as a good plant for play rooms or family rooms. Also known as Plectranthus purpuratus, this houseplant can live for years. Involve children in the pruning, and they can put the cuttings in water to watch new roots grow. Prune back to a leaf bud and the plant will develop a new branch there. Cut it back as much as once a week to speed growth. This type of ivy roots very quickly, and then potting the new plants can be another family project. The plant will fill out with new growth as a result of pruning. Black Swedish Ivy can be moved outdoors in the summer months and will do well under a shady tree if watered daily. It sometimes produces white or pink trumpet-shaped flowers. It prefers filtered sunlight and should be allowed to dry out completely between waterings. This houseplant tolerates heat and humidity. RELATED Outdoor or Indoor Bonsai: Which One is More Suitable? Ivy is a good choice for keeping the air in your child’s room clean. According to a 1989 study conducted by NASA and the Associated Landscape Contractors of America, ivy is on the list of houseplants that remove harmful air toxins such as trichloroethylene, benzene, and formaldehyde. In addition to purifying the air, by keeping a Black Swedish Ivy plant in a child’s room, a sense of ownership and responsibility is established. If the plant is not getting enough water, it will begin to lose leaves. These plants are also susceptible to more serious problems such as infestations of spider mites, mealy bugs, or the growth of fungus due to over watering. Teach children to pull off dead or yellowing leaves when they appear to avoid these issues. 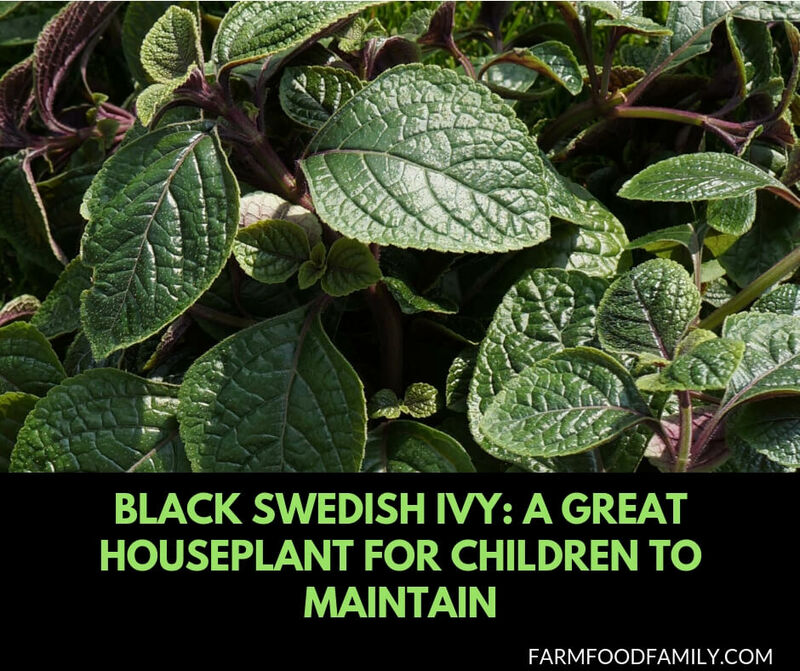 Instead of buying a pet, it might be a good idea to first allow children to care for and propagate a Black Swedish Ivy plant. They will enjoy seeing this hardy houseplant thrive and multiply under their care. Plus, children will learn responsibility and gain an appreciation for nature.